Memphis, 1939, a couple arrives at the hospital to deliver twins. They are told the twins did not survive. They do not quickly return home. Their five children waiting on the shanty boat are picked up and taken to an orphanage where they are told their parents will retrieve them. They are mistreated and names are quickly changed. Along with thousands of other children, they never see their parents again. Present day, Avery Stafford, a young lawyer in South Carolina is being groomed for her father’s position in politics. Her grandmother has just been admitted to a nursing home for dementia. Avery, who had always been especially close with Grandma Judy begins an investigation into her mysterious past and uncovers a connection between her and the Tennessee Children’s Home Society Orphanage. Based on one of the largest, most hideous and devious scandals, this novel describes the kidnapping, bribery, abuse and mistreatment of children and their families ever to occur in the United States. 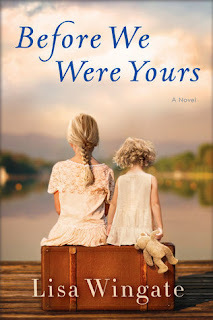 Author Lisa Wingate magically weaves together these dual timelines, the characters come alive and the reader is crushed by this heartbreaking reality.